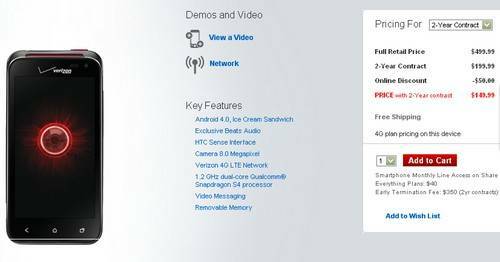 If you happen to be one of the Verizon faithful over in the US who is considering picking up the HTC Droid Incredible 4G LTE smartphone, which is expected to become available on the Big Red today, but can’t quite make up your mind, perhaps a traditional unboxing of the HTC Droid Incredible 4G LTE might help you come to a decision. Thus that’s what we have for our readers viewing consideration below, an unboxing video of the HTC Droid Incredible 4G LTE that comes our way courtesy of Aaron Baker over at Phone Dog, who says that the HTC Droid Incredible 4G LTE sits between the HTC One S and HTC One V, and is Verizon’s ‘One’ device. So, as usual we’ll kick thing off the a spec reminder, the HTC Droid Incredible 4G LTE offers a 4-inch Super LCD qHD touch screen along with a 1.2GHz Snapdragon S4 dual core processor, an 8 megapixel rear facing auto-focus camera with LED flash, 1080p HD video, a 1.3 megapixel front facing camera, WiFi, Bluetooth 4.0, HTC Sense 4.0, NFC, 3.5mm jack, 1GB RAM, 8GB internal storage, microSD expansion up to 32GB, a 1700mAh battery and run Android Ice Cream Sandwich. Aaron does say that the HTC Droid Incredible 4G LTE does resemble the HTC Rezound, but with a smaller form factor. And just so you know, the Droid Incredible 4G LTE has now released on Verizon Wireless today, and commands a price tag of $149.99 when signing up for the usual 2-year term. So there you go, all you need do now it head on down to hit that play button to check out the undoxing of the Droid Incredible 4G LTE, before heading over to purchase the handset..enjoy.